Who Grows Your Amazing Ambrosia Apples in BC? One of the best things about farmers’ markets is that you get the chance to meet the people who make your local goods and foods. But, you don’t always get to meet the folks behind the produce you buy. That’s why we decided a few years ago to start introducing you to the farmers who grow Ambrosia Apples in British Columbia. Over the years, we’ve taken our video cameras to big and small orchards from Cawston to Coldstream. What we discovered is that no two farmers are alike and they all have interesting stories to share. 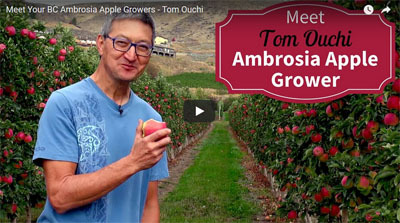 For example, our most popular grower video features orchardist, Tom Ouchi at his farm in Vernon, BC. Not only does he share his passion for growing Ambrosia apples but also the challenges three generations of his family faced operating their farm. In particular, how his family leaned on the close-knit Japanese-Canadian community, when there was a lot of racism in Canada following the second world war. We found his family’s history fascinating and his positive attitude is infectious – you can see the video here. Tom’s is not the only family immigration story we’ve shared in our videos. Farming in Canada is an attractive proposition for many immigrants – especially if it’s what they knew in their home country. Over the years, we’ve had the privilege of meeting many Ambrosia growers who came to Canada from farming communities in countries like India and Pakistan. For some of them, it’s a family business – either with their siblings or grooming the next generation of Ambrosia growers. While farming as a family is common, we also met some extremely capable solo farmers. Of note are Usha Saini and Julie Sardinha – two women running their Ambrosia orchards on their own. Mind you, they would never say they are doing it alone because they have the support of their community and extended family. We bet you’ll find them to be pretty impressive. That’s just a sampling of the amazing Ambrosia apple growers we’ve met and we think you should meet them all! And, we have so many more stories to share. If you like getting to know the people who grow your food – make sure you subscribe to our YouTube channel. We’ll share more stories soon.